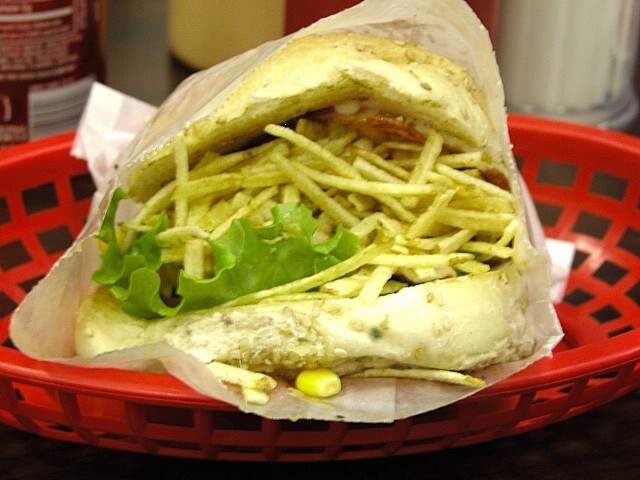 Is anyone familiar with a tradition of Brazilian sandwiches? A Brazilian owned sandwich shop opened in my area and I find the offerings... somewhat unique. Is this just one guy with a vision, or is this a real tradition or trend I haven't caught on to until now? Potato sticks. Not on the plate--as part of the sandwich itself. Corn kernels on a lot of the offerings--again as part of the sandwich itself. A very flavorful kind of "Brazilian" cream cheese, as a condiment. 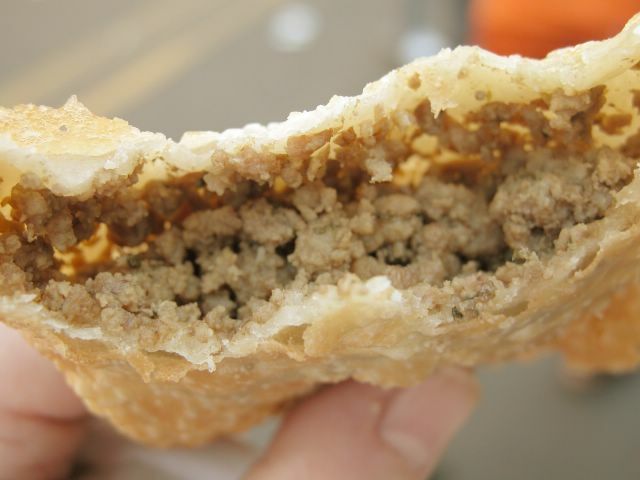 It's apparent called catupiry, since this same cream cheese is also used inside several of the Meat-filled pastries they sell and "catupiry" is in the name of all of them. Eggs. Not on all of the sandwiches, but a lot of them. The meat-filled pastries are interesting too. Many seem similar to mexican or spanish ones, but a few seem almost greek. Please note that my knowledge of Brazilian cuisine, up till now, has been pretty much limited to churrasco-rodizio. 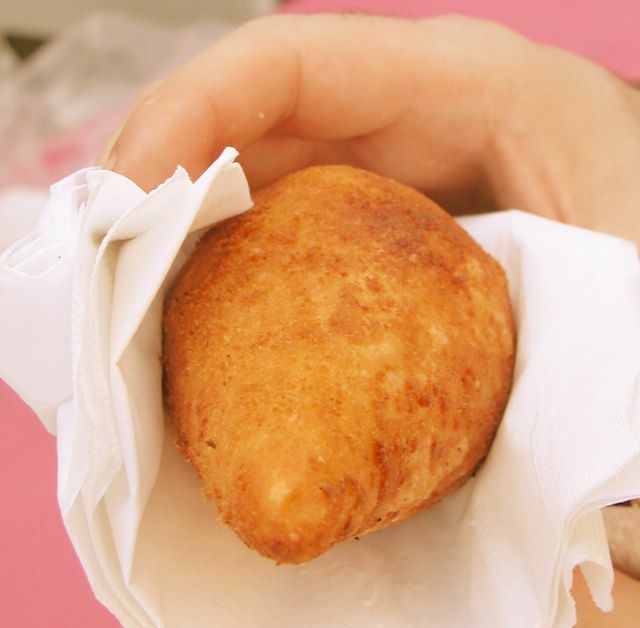 I lived in Sao Paulo in my early teens and lived for the day my Mom (who was born in São Vicente nearby) made those little meat-filled pastries. 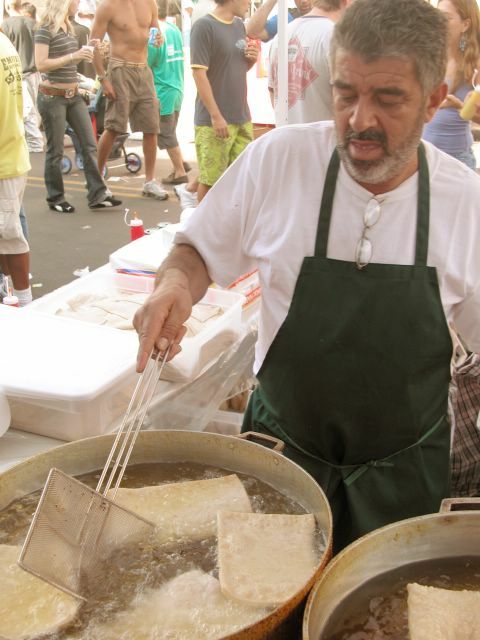 They are called Empadinhas (empa - deen - yah) and they are also made with chicken. Splash a bit of piripiri (hot sauce) on 'em! The beef and corn combo I remember hazily. Maria's On-line Brazilian Cookbook is a great source of food from Brasil for those interested in going beyond Feijoada or the Rodizio routine. I too am intrigued with the Brazilian sandwich, but find it strange that the phenomenon has not yet caught on in other metro areas of the US besides New Jersey -- it has everything it needs to be successful -- inexpensive, easy to prepare and it has that novelty/interesting combinations aspect that you think people would go for. 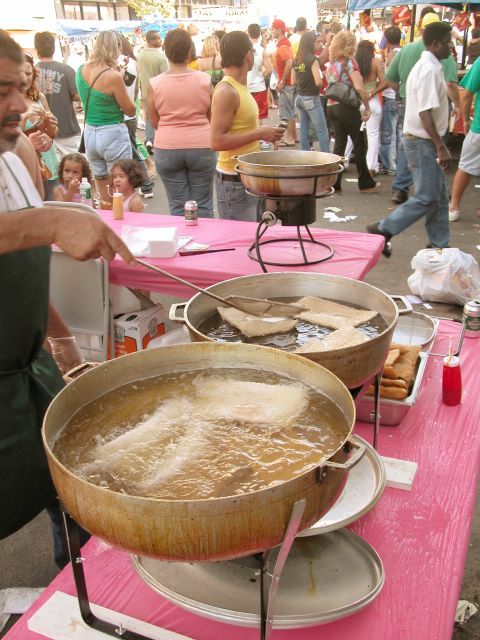 Plus Brazilian food is pretty much uncharted territory outside of the Newark area, and it has that tropical/endless party type mystique to it. And don't forget the misto quente - the ubiquitous grilled ham and cheese - served up at bus terminals up and down the Brasilian highways. I lived on sanduiches at Ipanema beach and they were unusual combinations - ricotta and pineapple one that stands out. If I can unearth my food journals of the 1980's, I'll come up with more examples. This reminded me of a sandwich which is actually Chilean, and may be one of the most popular lunch sandwiches in downtown Boston. The lines by the pushcart selling these was so long, that they eventually opened this small stand, in the Downtown Crossing/Financial District area and the lines got even longer. 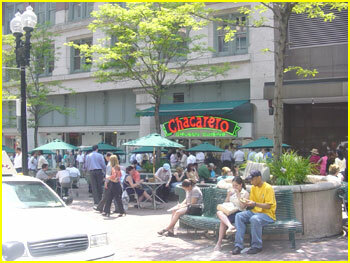 Rain or shine, people stand in line for a Chacarero sandwich. That's all they make is the sandwich, which sounds like a bizarre combination, but these things are addictive, inexpensive, and filling. 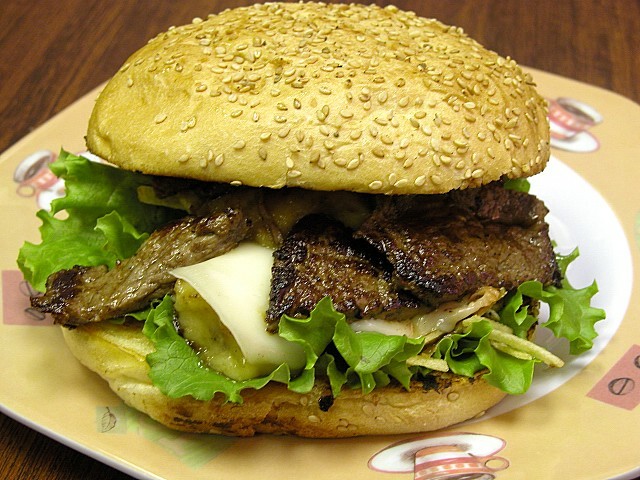 In their words, "A Chacarero is a traditional Chilean sandwich. It begins with homemade bread, that we make fresh daily. The main ingredient is either tender grilled steak or chicken (or both). Then with your main ingredient, we add steamed green beans, which gives it that authentic Chilean touch, Muenster cheese and fresh tomatoes. 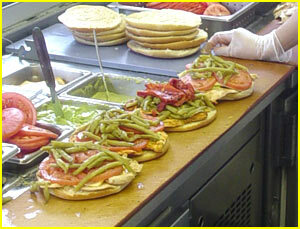 After that, we add an avocado spread, salt, pepper & our secret hot recipe to complete the sandwich. Of course any ingredient can be omitted, just let us know." The BBQ Chicken version, with roasted red peppers and extra hots, is my favorite. 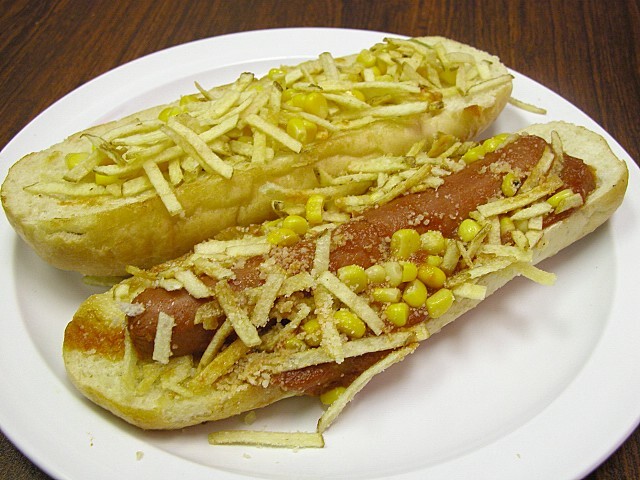 A "Brazilian Hot Dog". Note the Potato Sticks with Corn, which is a typical topping on Sanduiche. 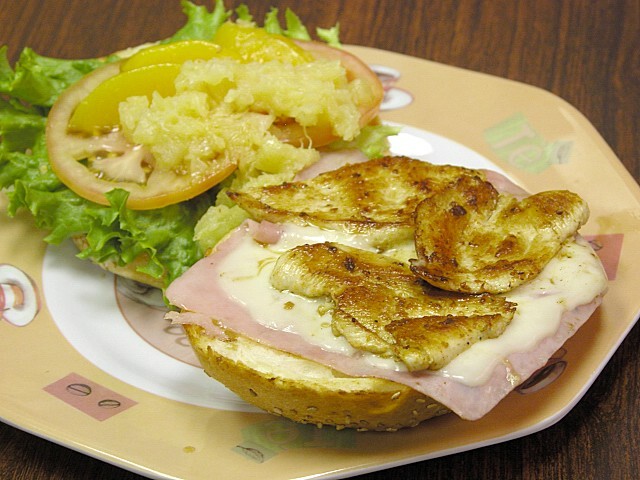 This one is grilled chicken breast, with ham and cheese, and sauteed pineapple and peaches. 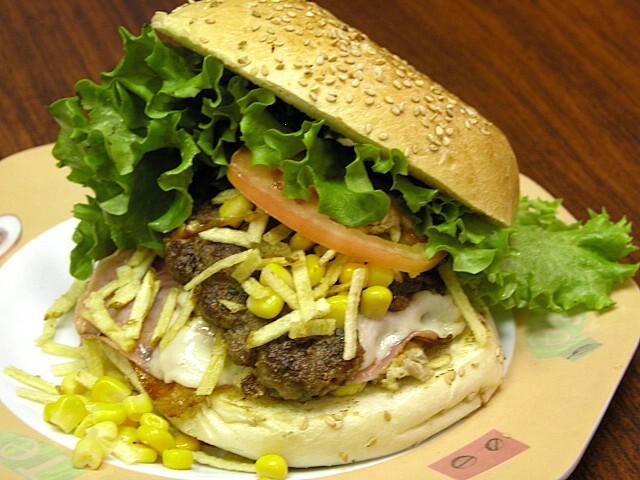 A Brazilian-style Hamburger, with the potato sticks shoved into the bun. Flank steak, with lettuce and tomato and cheese, with the potato stix/corn and mayo combo, and sauteed bananas. It sounds weird, but it really worked. 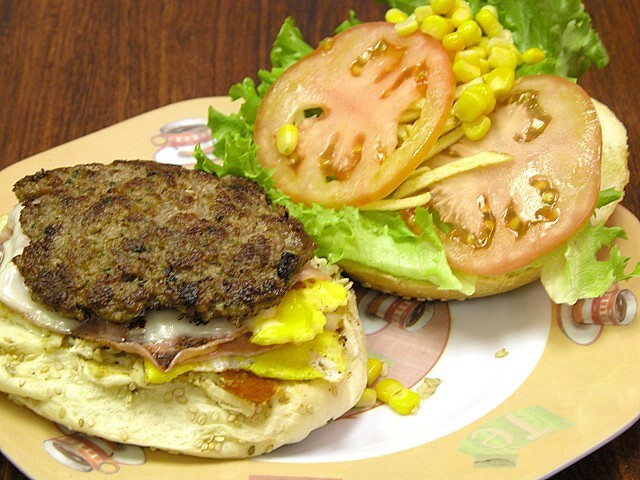 Note the bun, which is referred to as a Sanduiche bun. Its soft, but firm enough to hold up to a large pile of ingredients. This one, called the Sandubao (Giant Sandwich) had the kitchen sink -- hamburger, shredded chicken, fried egg, bacon, ham and cheese, again with the "works". Beautiful pictures Jason. 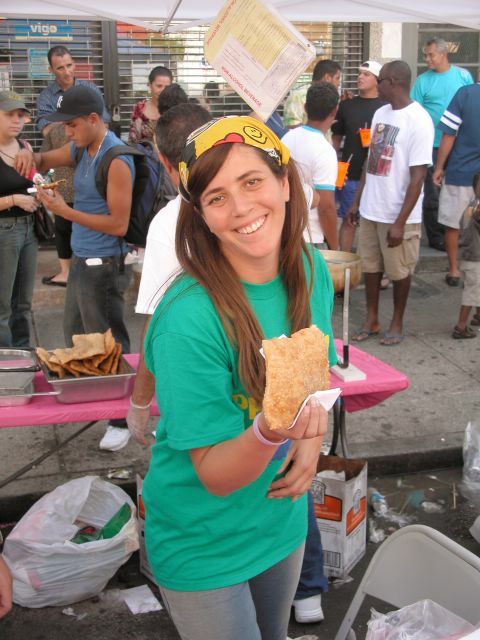 Their term for hotdog is a direct translation, cachorro quente (cashoho kenchee). They produce these treats in impossibly tiny and cramped bars along with the irrisistable salt cod fritters and the tasty empadas. The fresh fruits are amazing too, figs as large as tennis balls and sweet sop as large as coconuts three of them for five reais (about US$2.) I went to a rodizzio churrasqueria in Sao Paulo where absolutely everything was remarkable. What impressed me most though is the grace and friendliness of the people. Fascinating photos of the sanduiches, Jason- especially that flank steak one, truly mouthwatering! I wonder what type of banana was used, perhaps plantains? It was regular sweet banana. The grilled fruit was the real surprise for me. 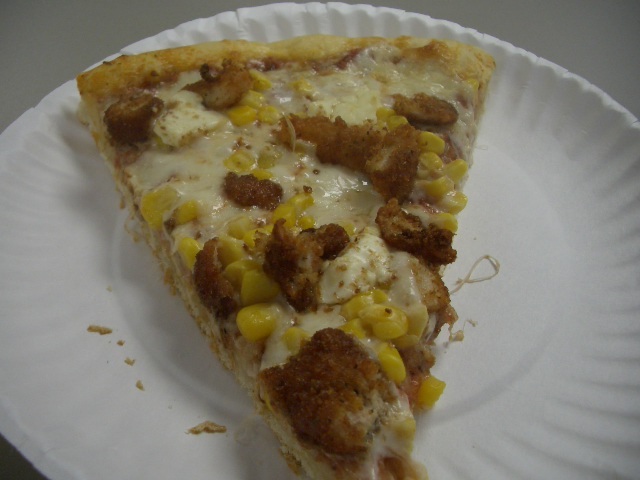 I can't even describe how well it works as a topping. The pineapple and peaches break down into something pretty pleasant, and they work like a wonder on top of those hamburgers (the meat of which is nicely spiced). 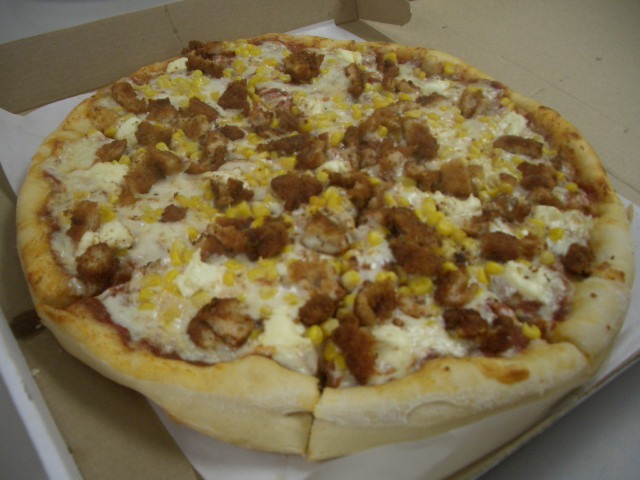 Note that the fruit toppings rarely seem to coexist with the potato stix/corn/mayo melange. 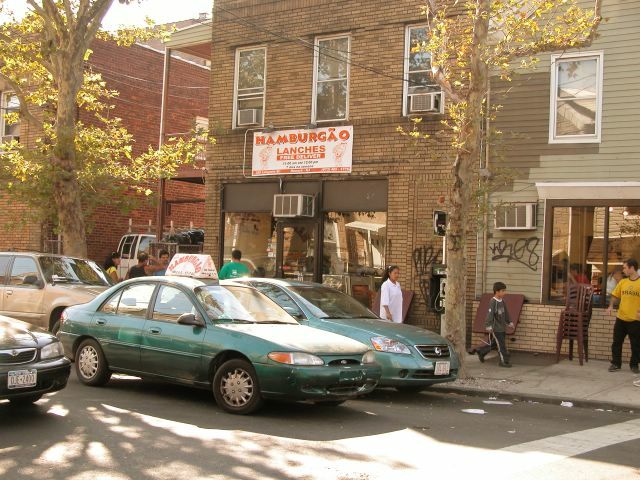 The meat is really high quality stuff--in the case of my local guy carted in from Newark, NJ--which is a huge cluster of Brazilian and Portuguese existence in the U.S. The bread is just indescribable. Those pix are fantastic. This is clearly something that could have a future as Jason said. I'm off to throw a little chopped pineapple on to a ham/cheese/egg/tomato/lettuce and ricotta sanduiche. oba! Anyone living near Berkeley, CA should check out the Brazil Cafe, at University and Walnut. It's basically a glorified shack on the side of the road. There are plastic tables and chairs on the sidewalk, there's always samba or reggae blaring, and the sandwiches are spectacular. 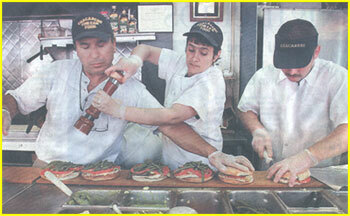 The specialty is a tri-tip sandwich that includes, like all the offerings, their heavenly cilantro-garlic sauce. I remember driving by this place last time we were in Berkley but didn't check it out because we had already eaten at another restaurant. I'm going again in a couple of weeks. May get a chance to check it out. 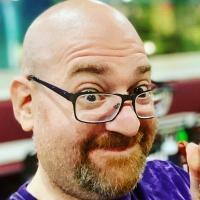 Awww, Jason, you are killing me! I haven't had those pasteles in a long time. I did not think anyone would give a damn about South American cooking then again I may have been wrong. 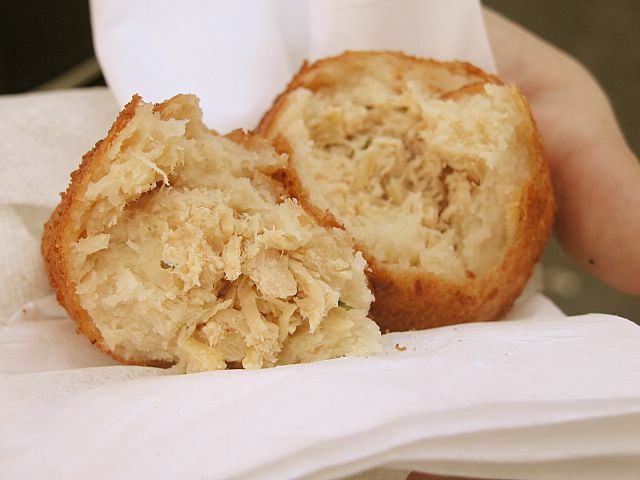 Didn't they make bolinhos de bacalhau? They had them at other stalls at the festival, and you can get them all over Newark. Here is something not too traditional.. I am sure this will disgust both Brazilians and Italians.. Say what you want, its good.. The crust is airy and crunchy.. The chicken is fried perfectly. .Goes really well with the corn and the creaminess of catupiry.. Very nice..
Wow, where did you get that? It looks mighty tasty. Sell it in Fort Lee (for those of you from elsewhere, that's also NJ). If the Brazilians don't eat it, the Koreans and Japanese will!